80 m2 apartment overlooking the sea and the estuary. Private estate with gardens and swimming pools. Porch of 22 m2 with private garden of 69 m2 semi giving gardens. At 600 meters from Rompido (center) and 1km. beach, lighthouse and marina. 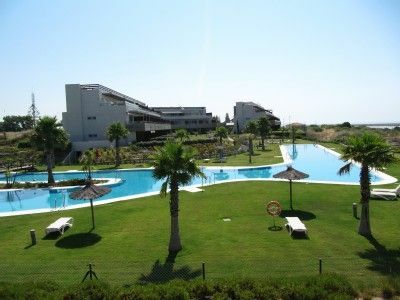 4 Golf courses very close (Club de Golf el Rompido). New and fully furnished. Located in prime area overlooking the sea. Master bathroom built into the bedroom with en suite. Spacious and modern. 2 Modern bathroom with shower. Both with shelves on the walls. Was in the same apartment and was as pleasent as last year. The owner and the keyholder were very helpful and welcomming. We enyoed the well equipped apartment and this year 2 sunbeds were added to the terrace. The apartment is highly recommendable. A comfortable, clean and well maintained apartment in a wonderful setting. Owner and key holder were helpful and welcoming.would highly recommend this property. Apartamento muy acogedor, limpio y moderno. Muy bien equipado con todo lo necesario. Disfrutamos a tope la terraza-jardín. Piscina tranquila y muy agradable para disfrutar con los niños. Muy recomendable. We stayed in a lovely apartment on the ground floor level during 6 weeks in February and March. Equipped with comfortable beds and fitted with all modern utilities. A nice terrace with garden furniture basking in the evning sun. we found our stay very pleasant and enjoyable and can easily recommend it. El Rompido has a lot to offer with shops and restaurants and with beautiful surroundings. It was very pleasant to have Birgitta Berle and husband. Very good couple who looked after the flat and left the last cleaning payed. I would like to thank them very much for their careness and I hope to having them next year. Visit the Coto Donana, natural protected area of ​​dunes, beaches and birds and native species. Beaches along the coast of more than 50 km. empty and natural. Beach Flecha, protected land at the sea.